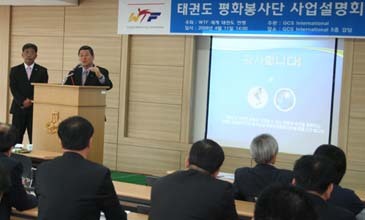 WTF Secretary General Jin Suk Yang speaks during an explanatory session on the WTF-promoted "Taekwondo Peace Corps" project at the GCS International building in Seoul, Korea, on April 11, 2008. The World Taekwondo Federation will launch its ambitious "Taekwondo Peace Corps" project in July 2008. "As the first action program of the WTF's Taekwondo Peace Corps project, scores of Taekwondo Peace Corps members will be dispatched abroad as early as in July this year," said WTF Secretary General Jin Suk Yang. Yang made the remarks at the explanatory session on the Taekwondo Peace Corps project held at the conference room of GCS International in Seoul, Korea on April 11, 2008. "Through the Taekwondo Peace Corps program, the WTF can ultimately contribute to the promotion of peace in the world," he said. The Taekwondo Peace Corps project is promoted by the WTF and organized by GCS International, a United Nations-recognized non-governmental organization with a special consultative status with the U.N. Economic and Social Council. GCS stands for goodwill, cooperation and service. WTF President Chungwon Choue heads the two international organizations. To select the Taekwondo Peace Corps members, the WTF and GCS International started receiving applications from Korean youngsters aged between 20 and 35 on April 16. The deadline of the application form submission is May 9. "After consultations with the WTF's 188 member nations, we plan to send the first 12 teams, one team consists of four people, abroad this July for one month," said GCS International Secretary General Jae-suk Bae at the explanatory session. "Of the four, three will be those with at least 3rd Kukkiwon Dan certificate holders." After a weeklong education, Bae said the Taekwondo Peace Corps members will be mostly sent to taekwondo-developing countries in Africa, South America and Southeast Asia. Shortly after becoming president of the WTF in June 2004, WTF President Choue promised to launch the Taekwondo Peace Corps project, thus helping enhance the image of taekwondo and the WTF in the international sports community. The WTF aims to expand the program to involve all Olympic sports into a "Sport Peace Corps" program in cooperation with the United Nations and the IOC. The Peace Corps idea was first raised by WTF President Choue at an international workshop on sports and peace in Leuven, Belgium on Sept. 21, 2007. Dr. Choue then proposed the creation of the Sport Peace Corps at an international forum on peace and sport in Monte Carlo, Monaco, on Dec. 6, 2007.